I am a small private breeder who thoroughly enjoys the poodle breed. I have 3 females and a male that are like my children. They are not sent out to a kennel or put in a cage to live. They spend all their time with me and my family. They even sleep with my husband and I. Our puppies are handled and shown a lot of affection. They are very sociable by the time they are ready for their new home. You will find the poodle breed to be loving little companions . Poodles have many great personality qualities. They are a very intelligent breed which makes them easy to train. They are also great family dogs, and love to be part of the excitement. If you are looking for an elegant breed of dog that has minimal shedding, the Poodle may be the breed for you. Poodles hold their shed hair in their curly coat, rather then release it onto surfaces. That is why poodles are considered the dog of choice for people with allergies. There are few people that are not captivated by the clever and cute face that the Toy Poodle possesses. Known for its personality and charm, this breed is an athlete as well. 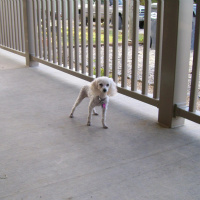 Toy Poodles are great at obedience and agility because of their willingness to please. I have named this website "Pleasing Poodles" because the most important thing to them is to please their owner. All of our puppies come with a 3 day health guarantee. They are AKC and CKC registered. They have been vet checked, wormed and have had their first shots by the time they are ready to leave. I will honor this guarantee if the buyer can produce a report from a licensed veterinarian describing a serious health problem within 3 days of purchase. At that time, the buyer will be offered a full refund upon return of the puppy or may exchange the puppy for another puppy of same value. 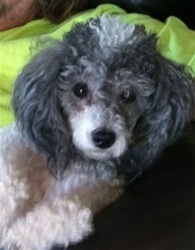 i love your advice i always look at this site whenever i need help with my dog sadie she is a small poodle. I am looking for a red toy female. Need a companion for my apricot toy. Do you have any available and how much do they cost? 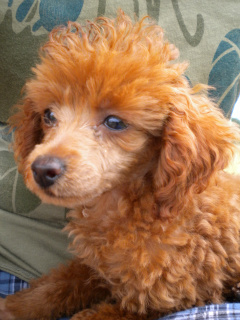 I am looking for a red or chocolate female toy poodle. Would also consider small miniature.